Discussion in 'Amps and Cabs' started by domsch1988, Apr 18, 2016. So, i play in a Band. We do Folk Metal stuff a'la Eluveitie. Currently it's Pod HDX through Poweramp and 412 for me. I use the 5150 model as my main rythm patch plus some clean ambient stuff here and there. We will record a album in August and in June i'll come up with money to finally up my amp game. JVM410 was on the list for versatility. It liked it, but it's all marshall in every channel. The range is huge, but again, the cleans are not my cup of tea and the high gain is not as saturated as i like. After test some other amps i feel i'm all over the place. Vox AC30 with the 5150 pedal was a plan too, but wasn't able to test that combination. I now think Victory. Either VX Kraken or V40. Then add some Pedals for the last bit of Distortion. Have a listen to some of Rabea Massad's Youtube clips of the Kraken, it sounds incredible to me and was based around a combination of a jvm and 5150. The only downside is that it has no "true" clean channel although it seems to clean up pretty well with the volume knob. I'd want to have a back up amp with great cleans before committing to an amp like that. Also check out the Mesa Mark V series. They sound incredible (I use on so I'm biased) and can get super heavy while having a world class clean tone. PRS Archon. Great clean channel and brutal gain channel. buddaman71, dsmc80 and Darkness like this. The Mark V 35 maybe the ticket. The EL-84's give more of a brit flavour to the clean sound and then a ton of flexibility for the gain channel. Another to check out is the Royal Atlantic. The clean may not be as bright as a Vox but it's very nice. Other than modellers I can't think of much else that fits your description. Maybe the Engager Renegade with a set of EL-84's, but their build quality is unreliable. If you're in Germany, I'd try some Engls and Diezels. I like the Engl cleans, maybe a Fireball 60 would work for you. H&K Grandmeister or new Tubemeister Deluxe? 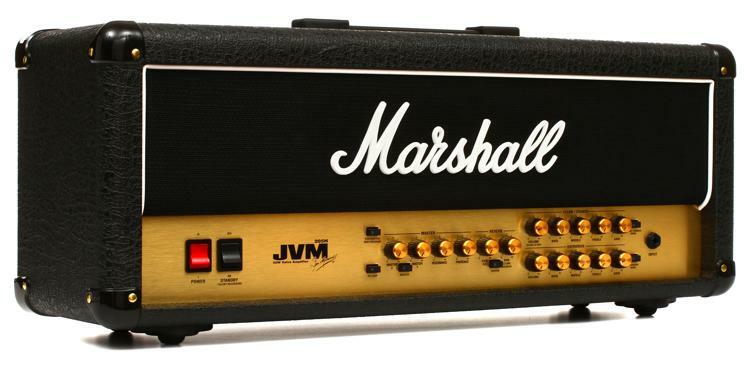 I'm thinking a Marshall JVM205H halfstack. -EVH 5150 III 50w-if you can find a combo jump on it immediately!!! There actually a 50w 5150 III STEALTH!!... clean channel? well it has fender cleans!!! cuz it is after all a FENDER.. Both will do the trick, pick which flavor you like best. best bargain is a 5150 from peavey. The new evh has a better clean channel but I still prefer the original lead channel. Right now I'm after an ENGL...They are pricey but built really well. Lots of options but simple to use. The new artist edition is really simple but gives you infinite possibilities. The steve morse model is even more crazy with the mid matrix on channel three. Most ENGL amps have the built in noise gate, effect loop and multiple master volumes. The only problem is that footswitch is not included. Can you rent or play through amps owned by the studio? That would give you access to a ton of amps to mix and match for the various tones you want. And you don't have to commit a ton of money on something, especially something you're not familiar with under the mic. Friedman has several flavors of that type of amp. Hard to rec just one. But based on my experience with them, I would always check out their high gain models. That's really their specialty. For example their brand new Butterslax model gives you a brutal Mastadon type sound. But really almost all their amps do killer high gain witout pedals. All his amps have good cleans too, and different flavors of clean. So you can choose something based on particular needs. The JVM205 is pretty much the same as the 410. If the JVM is where it's at in the end i'll spend the extra 200€ for the 410. V40 is of the list for now. Maybe V30 instead, dual channel and higher gain. I need to play one some time soon. Engl, i tried most of them. I currently own the fireball 60 which indeed has nice cleans, but the drive is just overcompressed and not focused. This seems to be the case with most engls. Those that do great drive again are well over budget sadly. Check out some of the offerings from Laney as well, I know that Mikael Arkefeldt of Opeth uses Laney. I use a Mesa Roadster 2-12 closed back combo and couldn't possibly ask for anything more from an amp. It can cover all of the ground you are looking for and then some. I will also tell you that coming from a modeler to an actual tube amp, you may not have as much gain as you are used to at first. I remember how disappointed I was in my first Mesa Rectifier after coming from Line 6... But after a couple shows, I realized I had more than enough.